There’s nothing better than knitting away on a pair of socks on the bus when it’s -30 degrees Celsius outside. 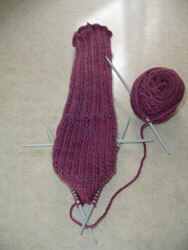 Again I’ve used the sock recipe from the Yarn Harlot’s book Knitting Rules. 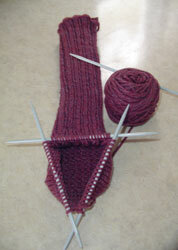 This time I’ve decided to do a ribbed sock and I made the cuff an inch long then the cotton socks. I’m thinking the next pair of sock will be lace knee-highs. See my nice reinforced heel? Not like that’s really going to stop the holes from coming, but my hope is the socks will last a little longer. Previous: Glad to be back!